H. Samuels is one of the oldest jewellers I’ve been to, having been around in one format or another for almost 200 years. Starting out as clock-makers and silversmiths, they grew their business in the mail-order format until opening up their first retail shop in 1890. By 1970 H. Samuels had over 200 stores around the U.K.
During the mid-eighties, H. Samuels saw many changes. Eventually they were acquired by the Ratner Group (since renamed to Signet Corporation). They currently have 300 stores worldwide, though they are mainly concentrated in the U.K.
For a company with such a rich and storied history, the experience was incredibly disappointing. We visited their location just off Regent St. in London. For those of you who are unfamiliar with the area, Regent St. is a high class shopping district with stores by Prada, Louis Vitton etc. The H. Samuels store certainly did not give off that same high class feel. It was facing an American Candy store with bright neon lights and the store itself had a very shabby exterior. The interior wasn’t any better. The place seemed drab and a bit dated. A shop assistant came over to help us immediately. She was very nice and tried to be as helpful as possible. She didn’t seem to know that much about diamonds, but that is expected at a large chain store. This is a common issue with chain stores. It’s impossible for a company that has thousands of employees and hundreds of locations to employ knowledgeable staff. And now we get to the heart of the problem. Their jewellry was very poor quality. The first ring we looked at was a 0.66ct “H-J” color “I3” clarity round diamond in 18kt white gold for 2,399. The diamond did not have a certificate but at this level, a certificate is pointless. The diamond looked so bad, even in the display, we didn’t want to bother with it. The saleswoman insisted and we got to try it on. We couldn’t actually see any part of the diamond that did not have an inclusion. The next one we saw was the same size but better quality. This diamond wasn’t nearly as bad as the first (seems like a good sales tactic), but it was still pretty bad. It was a 0.69ct G color, I1 that comes with an IGI certificate. They had it priced at 2,799. This is a great sales move as it wasn’t that much more than the first one, and the difference in quality was night and day. But we weren’t fooled by that. 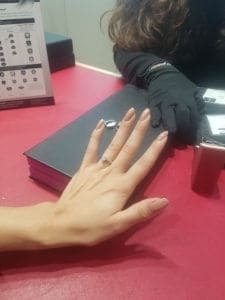 The quality was still quite low (lower than what we recommend) and Joy and I have seen enough diamonds in our lives to know that the ring, while nice in comparison, was not pleasant to look at. Lastly, we saw a half carat G, I1 round diamond in a palladium solitaire setting for 1,999. We’ve mentioned that we don’t like IGI, so we won’t belabor the point, but the quality seemed much lower than they claimed. Overall though, this was the best ring of the bunch. So how did these diamonds stack up to the competition? Not well. Not only were they poor quality, but the prices were out of control. Take the first diamond for example. Let’s compare it to this 0.67ct J SI2 excellent cut round diamond from Blue Nile that costs only 950. The diamond is superior in every way (its certified by GIA, better clarity by a country mile, and well cut) yet it’s a fraction of the price. If you add it to this solitaire setting, the price is half of what the H. Samuel ring will cost coming in at 1,200. I’m not even going to look for a new diamond to compare to the second diamond from H. Samuels. The diamond we used for comparison above is superior in quality and a fair (perhaps too fair) comparison. If you add it to this ring, the price comes out to 1,110 which is a whopping 60% less than the lower quality offering from H. Samuel. 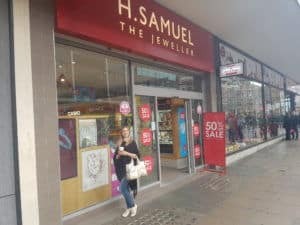 H. Samuel Jewellers is just not a good place to buy an engagement ring. The quality was poor, the rings were very overpriced and the in-store experience leaves a lot to be desired. 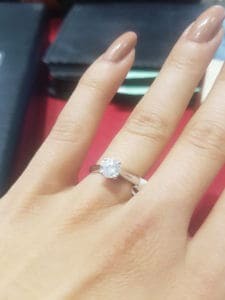 You are better off purchasing your engagement ring from a reputable online retailer like Blue Nile.